"Everyone in the world will come to these gates. Why? Because they want to look at the world of the future. They want to see how to make better human beings. That's what the whole thing is about. The cynics are already here and they're terrifying one another. What Disney is doing is showing the world that there are alternative ways to do things that can make us all happy. If we can borrow some of the concepts of Disneyland and Disney World and Epcot, then indeed the world can be a better place." Writer Ray Bradbury died Tuesday night, June 5, at the age of 91. He was the author of more than 27 novels and story collections—most famously The Martian Chronicles,” “Fahrenheit 451,” “Dandelion Wine and “Something Wicked This Way Comes” (made into a 1983 Disney live action)—and more than 600 short stories. He was also a passionate friend and fan of Walt Disney and the Disney theme parks. I am sure many tributes to Bradbury will include the word “passionate.” He was passionate about writing, about dreaming, and about helping others to dream. Having the advantage of growing up in Southern California and being a part of comic book fandom, I got the opportunity to meet Bradbury several times and was impressed with his graciousness and his love of the written word. He had the talent of being fascinating and frustrating at the same time. However, if any of us mentioned the magic word, “Disney”, it would spark a flowery oratory of the wonders of Walt and the world of Disney. Ray Bradbury first defended Walt Disney in 1958 when Julian Halevy wrote an unflattering piece about Disneyland titled "Disneyland and Las Vegas" for The Nation magazine June 1958. Bradbury immediately sent in an outraged letter to the editor in which he defended Disneyland as "an experience of true delight and wonder." Bradbury first met Walt in person in 1963. Here is the story Bradbury told many times as I listened to him at various events. "I was walking down a street in Beverly Hills and a man passed by with so many gifts he couldn't seem to hold them all. And then I saw it was Walt Disney!" Bradbury remembered. Bradbury introduced himself and asked Walt if they might have lunch together sometime. Walt turned the offer into an invitation and set up a lunch for the following week. "I got there at noon and Walt's secretary warned me that I better be out by 1 p.m. because he had a lot of work to do. Walt gave me a tour of the lot and showed me some hippos they had been building as well as the work they were completing on the audio-animatronics figure of Abraham Lincoln. When we got back around 3 p.m. his secretary just glared at me, and I told her it was Walt's fault," Bradbury said with a laugh. Bradbury described his relationship with Walt as a "quiet friendship" characterized by a mutual respect for each other's work. After that first meeting, during the next few years, Bradbury consulted with Walt, sharing numerous ideas and suggestions. In appreciation, Walt asked him what he could do to repay for the author. "Open up your vaults!" Bradbury replied and to Walt’s amazement. Walt did exactly that and let Ray select 20 items. "I still cherish those items in my house and I remember that as a great day in my life," said Bradbury in 1983. 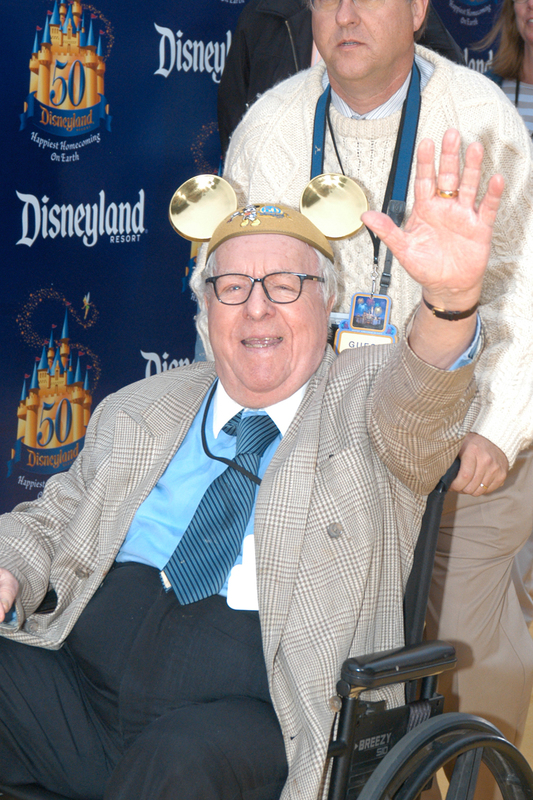 Ray Bradbury celebrates Disneyland's 50th Anniversary at a 2005 event. Photo by Frank Anzalone. Bradbury and Walt had informal talks about Disney's involvement in the 1964 New York World's Fair, as well as plans for Epcot. When Bradbury was contacted to work on Spaceship Earth, he said, "I wanted to put in some of the ideas Walt and I talked about many years ago." “Ray Bradbury did some very brilliant writing for a very broad concept which became the underpinning for everything we had done in Spaceship Earth," Imagineer Marty Sklar said. According to Imagineer Tom Fitzgerald, Bradbury's original script that was heard for several years in the attraction was too "poetic." "People couldn't process the poetic narration and still process the movement and what they were seeing," Fitzgerald said. "I rewrote it for Walter Cronkite, who recorded the new narration in the Magic Kingdom with a cold, at a fifth-grade level so that it was low enough that kids understood, but not offensive or boring for parents." Bradbury later defended Disneyland more poetically in an essay for Holiday magazine (October 1965) titled "The Machine-Tooled Happyland" indicating that instilling human qualities in machines would to enhance human life greatly in terms of education, service, and imaginative possibilities. "Walt Disney's Disneyland liberates men to be their better selfs,” Bradbury said. “The great thing is to walk around at Disneyland and see smiling people. And in the middle of the night you wake up and you feel something tugging at the corners of your mouth, and you put your hand up, and, by god, there's a smile there." To celebrate Walt Disney's World Tencennial in October 1981, there was a special color Sunday advertising supplement prepared just for the Miami Herald, the Orlando Sentinel Star, West Palm Beach Post Times, Tampa Times Tribune, St. Petersburg Times and Jacksonville Times. The supplement was titled, "Walt Disney World: Come Celebrate a Decade of Dreams." In addition to all of this, there were essays written by Art Linkletter, Ray Bradbury, and William F. Buckley Jr. As a tribute to Bradbury and to Disney, I unearthed my yellowing, fraying copy to share with MousePlanet readers. I think that most, if not all, the readers of this column may never have read it before now. When you are reading Bradbury's essay, remember that he is a poet and when he quotes Walt Disney, you should not assume those are exact quotes but just the remembered impression that Bradbury had of that particular conversation. I have no doubt that Walt said something similar to what Bradbury credits to the builder of Disneyland, but I also know that the cadence and selection of vocabulary seems different than how Walt talked at the time. However, there has never been a more passionate and articulate supporter of all things Disney than Ray Bradbury and I find his enthusiasm about the vision of Walt very inspiring and hope you might find it the same. "Can one man dream and build one city and change world history? "One man could. One man did. Walt Disney. "And you all know the "city": Walt Disney World. "Disneyland came first, of course. But Walt felt he needed more room for his architectural elbows. So he got his planners to imitate Alice in Wonderland. That is, swallow a vast sea of fresh blueprints from a bottle marked "Drink Me." "The result? Disneyland shot up, out and around to become Walt Disney World, a new kind of vacation city. "As a sometime science fiction writer, I am often asked to dare predictions. Dare I, then, in this Tencennial Year of the birth of Walt Disney World, predict that the social/psychological/building climate of America and many lands beyond, will be sensationally changed because of one man, one mouse, one dream? "True, we rarely think that just one man can shake and move a history of ideas and the world that grows from them. "But let us think the unthinkable. "What if Walt Disney had never been born? "Who, in his place, would have shaped the history of animated cartoons? Name some other man who might have made Snow White, Pinocchio, or risked his fortune on that incredible experiment, Fantasia? "Who, in all the continental United States would have had the smarts enough to build our first monorail system? "Do you have a list handy of creative geniuses anywhere between L.A. and New York who could ever dream, much less build, two Magical Kingdoms here, plus, in a few years—Tokyo Disneyland? "You have no such list, nor do I. "Yes, Walt surrounded himself with geniuses of every size, texture, artistic and technological ability. But they were pomegranate seeds. Walt was the whole damned pomegranate! "Mobs of kings built the cities of France. Napoleon touched parts of Paris. John Soanes restructured London in his night thoughts but never saw it brick on brick. Rome and Florence were mortared up by princes, popes and your occasional Michelangelo or Bernini. But Walt and his bright noon fancies stand alone in a wicked world and say: 'Let's Do Everything Over and Do It Right.' Walt says terrible things like: Joy, Smile or We Guarantee the World Won't End Tomorrow. "How did all this happen? Why is it so? "I saw early on that Walt was an incredible new species of plant, a burning bush with its head in the past and its roots in the future. And, indeed that's where our roots should be, not behind where you can't see, but ahead. "I saw this on a number of occasions when I was fortunate enough to have lunch with Walt, way back in 1963 and 1965. "I remember one noon when, arriving for lunch, Walt's secretary warned me: one hour, no more, just one! Walt had appointments. Walt had to run. "Seated there over soup and salad, casually set out on a card table in Walt's office. I listened to him talking about his childhood much like my own, comfortable with candy butchers and horse-drawn milk wagons, beginning to fall in love with the newly invented movies. "There lay Walt's greatest strength. He displayed constant proofs of his childhood. He wasn't childish in any way. He didn't let his memories get in his path. But he did use them and grow with them. He didn't let anyone talk him out of his loves, as most of us do by the time we are 17 and our so-called friends and well-meaning but ignorant relatives have brainwashed us into insignificance. Walt spoke of his past with immense affection, but the Future, now! Well, that was really something! "My time was up. The hour was over. I leaped to my feet and headed for the door! The secretary was there, eyeing her watch. "He swept me past a glaring secretary and out across the studio lot to confront a strangely beautiful mechanism. "'What do you think of that?' he said, beaming. "'It's nice, but what is it?' I said. "I climbed. We rode a fair distance up in the sky, in our individual brightly colored car. Walt enthused. "No use talking about the future, unless you build it. Some day, there'll be PeopleMovers like this around every city, and in every airport. Move more people efficiently. Leave cars behind." "'My family taught me. Taking my kids to various pier parks or kiddie rides. I gradually grouched myself in the direction of putting things right, cleaning up the perspiration and rust, as it were, firing the freaks, leaning the tent poles in the right direction, creating clowns that didn't terrify. Can't we, can't I, I wondered build a place that's beautiful and honest, where you can go without having to worry that the place is a secret pesthouse run by dope fiends on the lam?" "We were off the People Mover now and into a building where Abraham Lincoln lay on a table, in the final stages of being brought to Audio-Animatronics life. "'We've been writing and talking about humanoid mechanical creatures for centuries, but you're the first to really pay attention. By 2001, educational groups, finally catching on, should learn from your lead and build historical or philosophical rooms in high schools, universities. Places where you walk in, find and ask Plato, 'How goes it with the Republic?' and he tells you." "We were off again at a good pace. "This time we wound up at a spread bas relief of Walt Disney World, still up ahead in the future. Walt leaned over it with the same happy look of a boy with his first Christmas morn electric train. "'Thanks to Dr. Schweitzer,' I said. "'The good doctor was always saying, 'do something.' Someone may imitate it. Especially do something good or excellent. Well, that's you. People will be imitating you far beyond the end of the century. You haven't just built a family amusement park, you've shown people how to walk, sit, look at others, relax, stay human, stop swearing, start smiling." "Thousands of city planners, urban redevelopers, ramshackle architects, big-time builders will march through Walt Disney World in the next 20 years, and go home wondering: 'Where can I buy a bottle of that stuff marked "Drink Me" so I can get drunk on Walt's dream, rebuild my town, replant the city gardens, reinvigorate the fountains, collect sun power, rethink the citizens, replan our future, bigger if need be, smaller where necessary?'" "Most of the young architects I have met in the last 15 years, one way or another, have come under the spell of this Kingdom that truly works. It is these same architects who are spreading out now, across country, to redesign and save parts of San Diego, Dallas, St. Louis and beyond. They are drunk on the future, and Walt Disney has made them so." And thanks to Amid Amidi who has written the forthcoming definitive book on the life of Disney Legend Ward Kimball, here are some notes from a November 1988 meeting where Bradbury and Kimball were called in to discuss how the Disney Company should support the U.S. space program. The thoughts and condolences of the entire MousePlanet staff go out to Ray Bradbury’s family, his friends and all who loved and will miss him. Thanks for this article on one of my favorite authors. It was really nice to read his words again, and enjoy that special poetic cadence that infused all of his books and short stories!